Redearslider.com :: View topic - preventing overgrown beaks? Box Turtle and Tortoise Discussion :: preventing overgrown beaks? Posted: Sat Jul 05, 2008 11:46 am preventing overgrown beaks? Any suggestions for keeping a box turtle's beak from becoming overgrown? Apollo always has cuttlebone and seems to go through it pretty quickly, and he has a rock that we try to feed him on (although he tends to drag the food off of it and into his hut). His beak doesn't look overgrown yet, but I think it looks like it's grown a little in the year since we got him, so I'm wondering if there's anything else we can do to keep it nice and trim. How large is the beak? Aside from the cuttlebone, crunchy foods that are healthy for him. I'll post a current pic sometime tomorrow. What other sorts of crunchy foods? I'm mainly concerned with the outer corners of his mouth, that's where it seems to be the longest. For those of you unfamiliar with Apollo, he's not sick or anything, he was born with an oddly shaped face and is blind in the right eye. Also, he's filthy in this pic because he had just dug his way up from underground. I gasped when I saw that pic! And not cause I thought he was sick or anything...I just think he is SO DAMN COOL! I like his face, it's got CHARACTER! Snails would work, if boxies eat snails (they're shells aren't hard but do have some give to them). What about pieces of melon (cantelope or watermelon) that are cut close to the rind (just above where the fruit is and a little below where the green and white is). Will he eat melon? That would be firm but not overly hard. Yeah he looks like an old man saying, " Get off my lawn!!". Yes, the jagged looking line is the edge of his beak. I was looking at a picture from when we first got him and it was much smoother. I'm not sure why that's happening. Thank you for the suggestions, I bet he would love the melon. 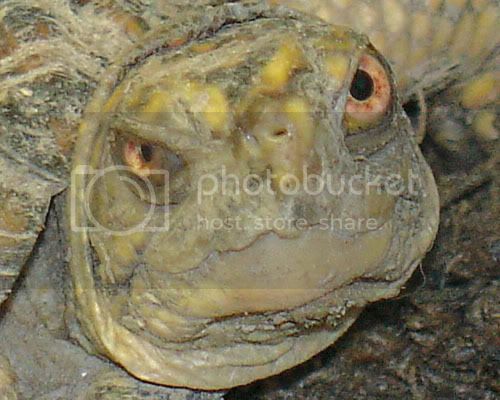 I've always wondered wht aquatic turtle's beaks don't nead trimming, but Land turtles do. I'm curious---does he make a squeaking sound when he eats? pcbuilder14---your 1st comment made me laugh. All I can think of is the cuttlebone, there's not really anything else in his enclosure that he could be chewing on. He has made squeaking sounds in the past, but I haven't noticed it recently. Starchick wrote: Yes, the jagged looking line is the edge of his beak. I was looking at a picture from when we first got him and it was much smoother. I'm not sure why that's happening. Thank you for the suggestions, I bet he would love the melon. probably because hes ageing...looks pretty old, how old is he? 2 RES Squirtle and Screw.. He's actually only about 4 years old. That pic is super enlarged, his shell is only 3.5 inches long.